A loan of $5,000 helped launch Source, an oyster bar and retail shop, by funding the purchasing of equipment and providing working capital. Being married to a member of the United States Coast Guard meant moving every two to four years for the last sixteen years. With my husband's retirement, we were finally able to plant roots and make a home outside the Coast Guard. When my husband began his last tour as the executive petty officer of Station Tillamook Bay in Garibaldi, we quickly fell in love with the natural beauty of the Oregon Coast and decided to make Tillamook County our permanent home post-retirement. I have experience with the seafood industry through working at CS Fishery, a Garibaldi based seafood company with a focus on sourcing sustainably harvested fish landed by local, small boat fishermen directly to consumers. I'm passionate about empowering consumers to make healthy, sustainable food choices for themselves, their community, and the environment. Through Source, my goal is to match our local producers directly to consumers and to highlight the bounty that comes from healthy land and seas. This loan is special because it helps empower a sustainable seafood business. Source is an oyster bar and retail shop featuring fresh seafood, meat, and produce from Tillamook County. My husband is a commercial oyster farmer and noticed that the majority of the oysters harvested from Netarts Bay, which are famous for their quality, were being bundled on a truck and shipped to Portland or California or even further away. There were very few spots where a local resident or a visitor to Tillamook County could sit down and enjoy a dozen oysters paired with an Oregon wine. We came up with the concept of an oyster bar. Through my work at CS Fishery, which is located in Garibaldi, I felt that the city of Garibaldi, an authentic fishing village, would be a perfect location. It also seemed a natural offshoot to have a retail section featuring fresh sustainable seafood line- caught by Garibaldi small-boat fishermen as well as meat and produce from local farms. We are partnering with Netarts Bay Oyster Co, CS Fishery, Nehalem River Ranch, Lance's Farm Vittles, Brickyard Farms, and DeNoble Farms to provide the highest quality seafood, meat, and produce harvested in Tillamook County to our local community. We want to match small local producers directly to consumers and to keep more dollars in our local community. Opening Source will allow us to highlight the quality seafood, meat, dairy, and produce that Tillamook County has to offer and be part of the economic revitalization of Garibaldi by providing a unique dining and shopping experience for both visitors and locals. Our patrons will be able to sit down, relax, and sample fresh Netarts Bay oysters, harvested by my husband, and paired with a selection of Oregon wines from small vineyards, or shop for fresh seafood line caught by Garibaldi small boat fishermen to take home and prepare themselves. We'll also have meat, produce, and dairy products from Tillamook County farms available. In addition, Source will serve as a hub for Tillamook County's burgeoning agritoursim sector. A Kiva loan will enable us to purchase essential equipment such as coolers, freezers, and furnishings. It will also provide working capital so we can pay our vendors, contractors, and employees prior to opening, which will keep money flowing through our local economy. Why are you endorsing Jennifer? 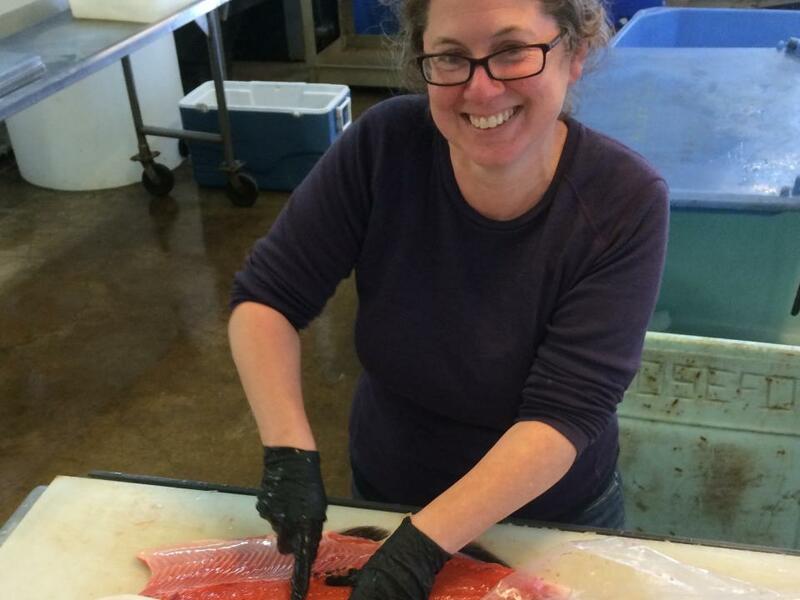 Jenn has been a pillar in CS Fishery and the local boat-to-table movement happening here on Oregon's North Coast. This project plays a vital role in making fresh, sustainable caught fish available to the public. Jenn's experience in the operations of CS Fishery and her successes in bringing fresh and prepared seafood to local farmers' markets are a huge springboard to launch Source into a year-round destination, not only for seafood but also as a grocery hub specializing in locally produced meats and vegetables. The Nehalem Valley Farm Trust is excited to support another great venture that helps strengthen our local food economy.